This was an amazing hotel and very good value for money. As our first trip to amsterdam we found the hotel a great location, the train directly from the airport to central station then its over the road perfect. Was also very close to all restaurants pubs red light etc. We up graded our room and the bed was the biggest bed ever with also a large room and bathroom. Although we did not see any entertainment, entertainment in Amsterdam is great and although we were informed prior to the holiday it is not very romantic I happen to disagree had a fantastic trip! Only downfall was we assumed the breakfast was free and found out it was 20 euros each which was expensive seen as though we just picked at it, the restaurant is lovely but the food was not good value! In fact want to go straight back and if we do we want to stay here again 10 out of 10. 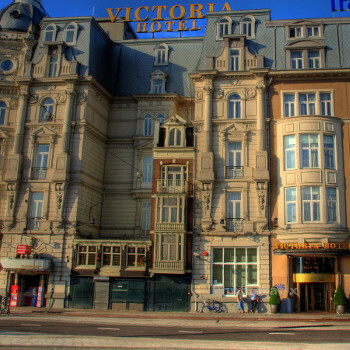 Stayed 1 night at the Victoria Amsterdam. It was a nice place with a great location. It is located literally across the street form Amsterdam Central Station, a 5 minute walk to Dam Square. If you plan to travel by train in Holland or to Schipol airport this hotel has great location.